VERIFY: Is the FDA conducting food inspections during the shutdown? The Food and Drug Administration is in charge of inspecting domestic and foreign food — is that work being done during the government shutdown? The FDA is responsible for conducting hundreds of food inspections each month to keep millions of Americans healthy. As the government shutdown extends into its third week, we wanted to Verify: Is the FDA conducting food inspections during the shutdown? Our source is Scott Gottlieb, the commissioner of the US Food and Drug Administration. 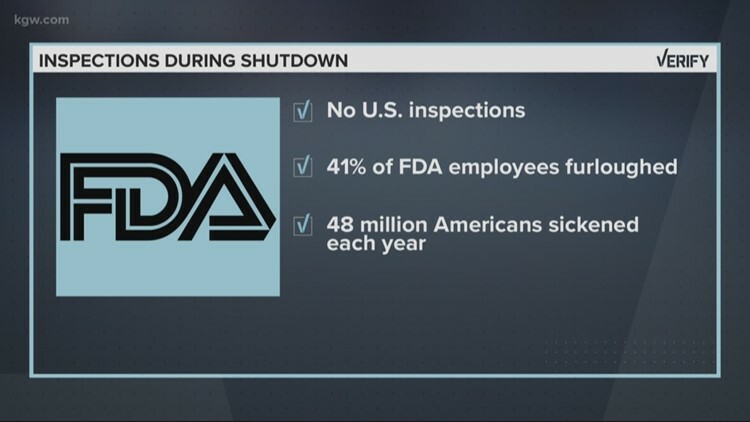 According to NBC News, about 7,000 of the FDA's 17,000 employees have been furloughed since the shutdown began on Dec. 22, 2018. What food does the FDA inspect? They do not inspect meats or poultry, but they are in charge of inspecting most other food production across the country. They conduct about 8,400 domestic inspections a year, which shakes out to about 160 inspections a week. A third of those inspections cover "high-risk" foods, like dairy, seafood, fruits, vegetables, infant formula and medical foods. What's the FDA doing during the shutdown? According to Gottlieb, FDA food inspections were scheduled to start back up the week of Jan. 7 through Jan. 11 after a two-week break during the holidays. Gottlieb said this week was an anomaly as the FDA was preparing plans on how to handle food inspections for the rest of the shutdown. They missed a few dozen inspections that have been postponed. According to Gottlieb, the FDA has halted inspections of non-high-risk facilities during the shutdown, and will try to conduct routine inspections of high-risk food facilities. Gottlieb said the FDA is still conducting regular inspections of foreign food imported to the US. We can Verify: Non-high-risk food inspections are not being conducted during the shutdown. However, the FDA wants to resume scheduling their regular inspections of high-risk food next week. NBC News reports that individual companies can still conduct their own inspections, and the FDA will still announce recalls. According to the CDC, 48 million Americans are sickened and 3,000 die because of food-borne illnesses each year. With no end in sight for the government shutdown, Gottlieb wants to call back about 10 percent of the FDA workforce to help conduct those "high-risk" food inspections. Unrelated to food inspections, the FDA has also shifted some of their funding to drug safety surveillance over pre-market drug review. What about the CDC or the Department of Agriculture? The Centers for Disease Control and Prevention, which monitors and prevents diseases, is conducing its business as usual and is not affected by the shutdown. In fact, they announced this week the romaine lettuce E.coli outbreak is over. The Department of Agriculture inspects meat and poultry products, both domestic and foreign. Most of their workforce is still working during the shutdown, and those inspections should not be affected.